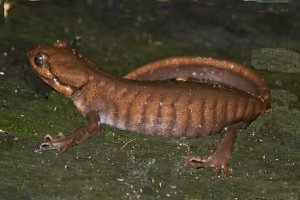 The northwestern salamander which is often called the brown salamander because of its brown colouration. northwestern salamander is the only salamander specie in Canada that possess poisonous glands like those of toads. Northwestern salamanders are large mole salamanders that reaches up to 20cm, half of it consisting of their tail. In Canada northwestern salamander population are composed of 2 subspecies found on the Pacific coast in British Columbia including on Vancouver Island. Northwestern salamander are nocturnal, spend a lot of time underground or often hides under logs, rocks or leaf litter in forest near ponds. Adults are more frequently observed in the breeding season occuring on spring as they move to breeding ponds. Juveniles and larvaes spend all their time in the water, feeding to get bigger. Adult northwestern salamanders eat slugs and small invertebrates while juvenile feed mostly on small aquatic invertebrates..